There are seven different "steak toppings" offered at Hungry Hunter Steakhouse as well as a new garlic lovers New York steak, seen here. 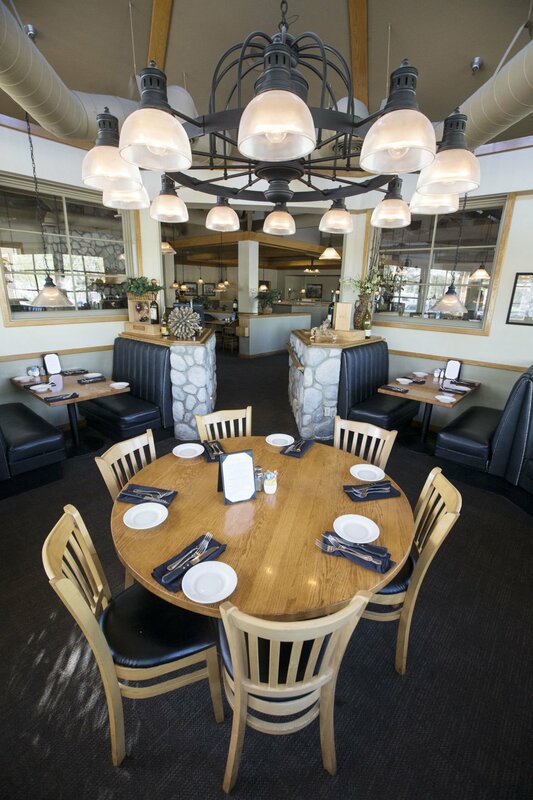 The dining room at Hungry Hunter Steakhouse has a rustic feel. Hungry Hunter Steakhouse is at 3580 Rosedale Highway. Bea Asbury and Bob Ballew take advantage of the happy hour specials offered at Hungry Hunter Steakhouse at least three times a week. The deals are available weekdays from 2 to 6 p.m.
Server Tammy Abbott takes the order of Paul and Victoria Forster, who were celebrating their 10-year wedding anniversary with dinner at Hungry Hunter Steakhouse. Hot and spicy shrimp at Hungry Hunter Steakhouse is one of the dishes available with a happy hour discount. Dig into some calamari, one of the appetizers at Hungry Hunter Steakhouse. It's not all red meat at Hungry Hunter Steakhouse. The restaurant is currently serving chipotle mahi mahi as one of its seasonal specials. Happy hour at Hungry Hunter Steakhouse runs weekdays from 2 to 6 p.m. in the bar featuring a select list of appetizers and sandwiches for half off, and the same discount for house wines, well drinks and four domestic beers. Items include the cheeseburger, served with fries for $6.50. Take a spin with the salad wheel to customize your greens at Hungry Hunter Steakhouse. There are seven different “steak toppings” at Hungry Hunter Steakhouse as well as tasty options like the garlic lovers New York steak. Desserts made in house at Hungry Hunter Steakhouse include the carrot cake. Desserts made in house at Hungry Hunter Steakhouse include the crème brûlée. Many restaurant chains have not survived over the years, places such as Kenny Rogers Roasters, Howard Johnson’s, Lum’s, Burger Chef and Steak and Ale. The closest thing to our Hungry Hunter is Sambo’s, once a nationwide coffee shop chain that has exactly one location left, on West Beach in Santa Barbara. If you visit you’ll discover the many reasons why Hungry Hunter is a gem: great steaks at what can seem like a value price considering the quality, awesome happy hour deals, a kitchen that is skilled with sauces and constantly staying abreast of trends with its seasonal specials menu, prime rib available even at lunch and a wait staff that could remain Gandhi-like while handling one of the most difficult customers we’ve encountered sitting next to us during a dinner visit. Oh, and six desserts all made in house by a gifted pastry chef. Let’s talk happy hour first. It’s weekdays only, 2-6 p.m. and there is a select list of appetizers and sandwiches for half off, and the same discount for house wines, well drinks and four domestic beers, including Shock Top. I always have to get the cheeseburger ($6.50 after discount) because it’s thick and juicy and made with superb fresh ground beef, but on a recent visit I discovered another tempting choice, the hot and spicy shrimp ($6), a half-dozen jumbo grilled shrimp served in a Tabasco butter sauce, with two pieces of garlic bread to sop up the excess sauce. House chardonnays that night were $3.25, and far from some pedestrian box wine. The place is typically crowded and we got the last two seats at the bar. With our dinners we got to select soup or salad and two side dishes. My companion chose the soup, a corn chowder that did not wow her. Nobody’s perfect I guess. I always like the salad wheel they bring to the table as it lets you build the salad of your choice — lots of cucumbers, no garbanzo beans — and the ingredients were exceptionally fresh on this visit. My steak was accompanied by au gratin potatoes with an alluring scorched crust on top and deep-fried green beans. The au gratins were simple, not exotic, but my companion couldn’t keep her fork out of them. The steak was a beautiful creation with the criss-cross grill marks, four roasted garlic gloves, some dainty sautéed onion strings and what had to be a brush of butter or olive oil to accompany it, all on a bed of kale sautéed in olive oil. The taste of the bulb was everywhere, the meat was perfectly done, and this quality beef at a price in the thirties is just hard to believe. I know quality beef is expensive, but in true Hungry Hunter fashion, it didn’t disappoint. My companion’s seafood was just as impressive, presented with perfectly steamed broccoli and red mashed potatoes. The seafood was exceptionally fresh, lightly breaded and crunchy, the chipotle coming from a sauce drizzled over it in a crosswise pattern. It typified the overwhelming theme of everything we sampled on both visits: exquisite freshness. No matter what you do, get one of the desserts. We struggled to choose from the six options, opting for the carrot cake ($7.49) and it was amazing, moist but not too oily, thick with a superb cream cheese frosting studded with nuts. For the record we spurned a crème brûlée, a vanilla cream cheese pudding with Oreo crumbs that we’ve loved in the past, an apple cheesecake that looked sinful, a strawberry cheesecake and a house-made fudge brownie with ice cream. Service was first rate and professional for everyone, especially Mr. Cranky sitting by himself next to us. Due to our eavesdropping special powers, we discovered that he was from out of town and had never been to this restaurant previously. Some inattention early on set him off and he was almost ballistic, complaining “I don’t know if I’m comfortable eating here.” That brought the manager over who handled the whole matter with skills that would work wonders in the U.N. as he got the guy to calm down. By the end, the man was raving about the lamb chops he ate and almost, almost apologizing for his bad attitude earlier, knowing he came this close to missing out on a great meal. My companion confessed she wouldn’t have had the patience — and I doubt I could have either — but the staff here is very polished. At the very least I hope the abused waitress got a decent tip out of it. They handled us perfectly, without any ranting warranted or offered. Hungry Hunter can be recommended for a fine dining experience. Now more than ever. Hours: Lunch 11 a.m.-2 p.m. Monday-Friday. Dinner 3-10 p.m. Monday-Friday, 4:30-10 p.m. Saturday and noon-9 p.m. Sunday. Reservations recommended. Happy hour 2-6 p.m. Monday-Friday. Prices: Lunch appetizers $9.99-$13.99, soup and salad $4.50-$15.99, sandwiches $11.99-$17.99, entrees $14.49-$24.49. Dinner appetizers $9.99-$13.99, dinner salads $14.99, chicken, ribs & chops $21.99-$31.99, steaks $25.99-$33.99, seafood & pasta $21.99-$24.99.